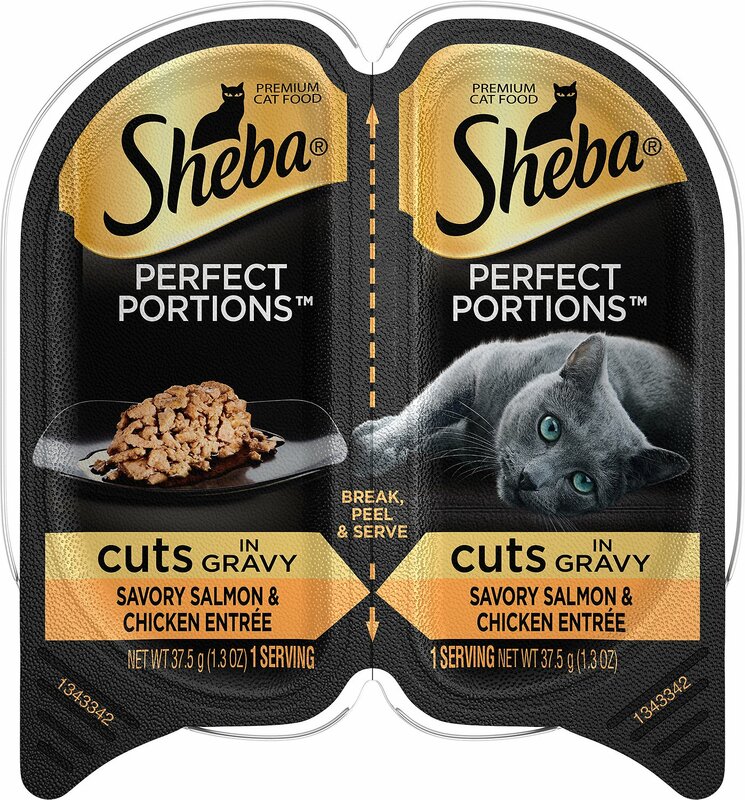 Sheba Perfect Portions Grain-Free Savory Salmon & Chicken Cuts in Gravy Entrée satisfies your kitty’s cravings for the taste of real meat. 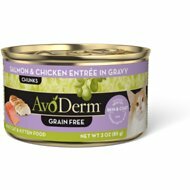 Made with real salmon and chicken plus essential vitamins and minerals, this premium cat food delivers a mouthwatering feast in a kitty-size serving. Instead of having cold leftovers that your cat refuses to eat, you can serve one 1.3-ounce serving and save the other for the next meal. 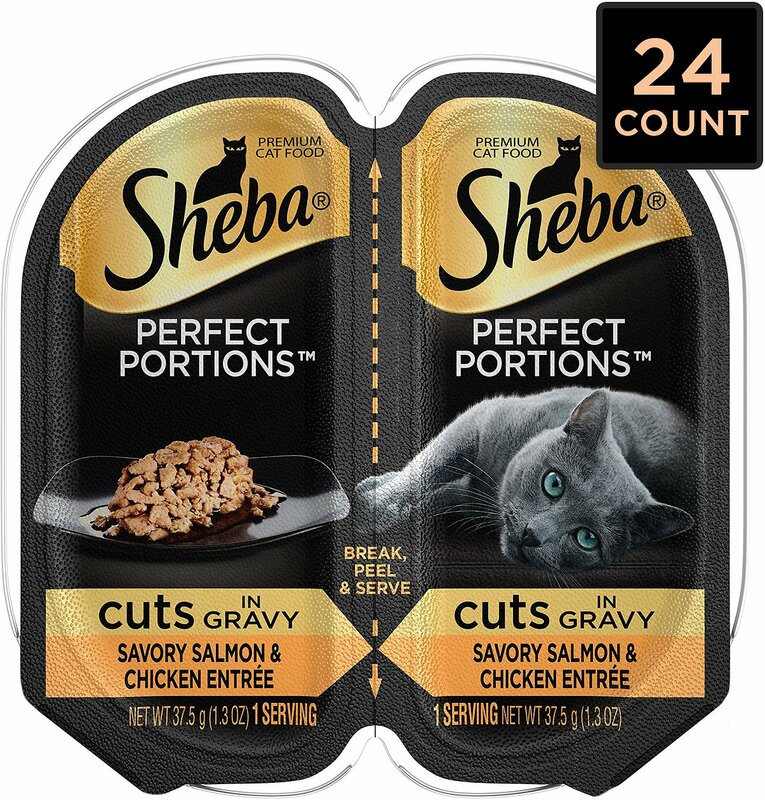 Sheba Perfect Portions wet food is formulated without gluten, soy, corn or wheat and contains only high-quality, grain-free ingredients. 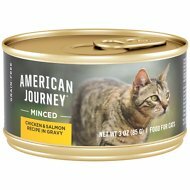 Made with real, high-quality salmon and chicken in a tempting gravy sure to please your kitty! 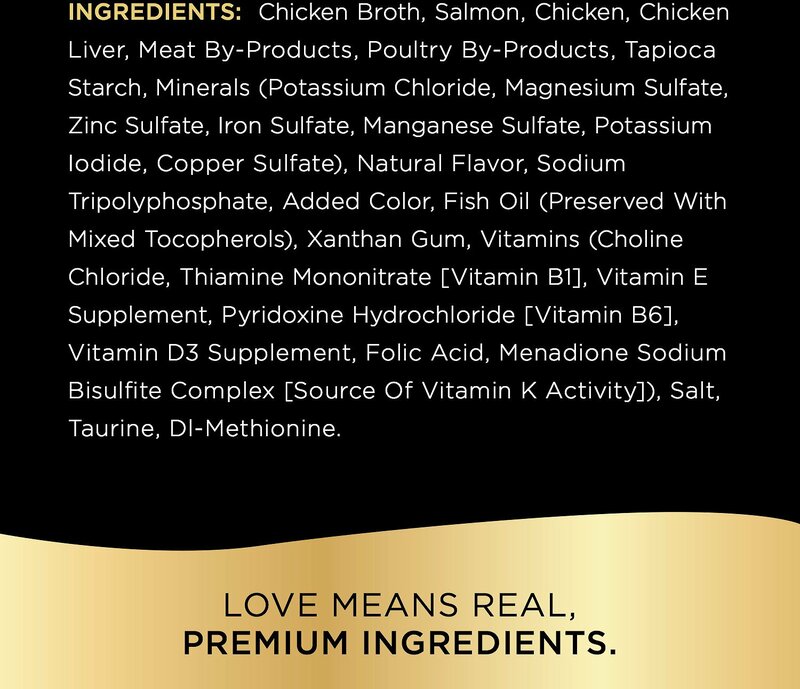 Chicken Broth, Salmon, Chicken, Chicken Liver, Meat By-Products, Poultry By-Products, Tapioca Starch, Minerals (Potassium Chloride, Magnesium Sulfate, Zinc Sulfate, Iron Sulfate, Manganese Sulfate, Potassium Iodide, Copper Sulfate), Natural Flavor, Sodium Tripolyphosphate, Added Color, Fish Oil (Preserved With Mixed Tocopherols), Xanthan Gum, Vitamins (Choline Chloride, Thiamine Mononitrate [Vitamin B1], Vitamin E Supplement, Pyridoxine Hydrochloride [Vitamin B6], Vitamin D3 Supplement, Folic Acid, Menadione Sodium Bisulfite Complex [Source Of Vitamin K Activity]), Salt, Taurine, Dl-Methionine. Each day, feed Adult cats 3 portions per 5 lbs of body weight twice daily. Feed pregnant and nursing cats 2 - 3 times their normal amount. Feed a kitten up to 5 portions twice daily. 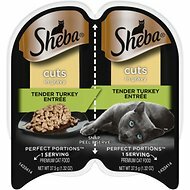 Sheba please in your large variety packs they should have equal pks of each flavor cats are finicky and for the price they shouldn't have to tire of one flavor! For some reason these cats like certain of these type products and not others. This one seems to finally be one they always like. The cats will eat it. Its not a favorite, but my guys are picky. I do like the individual serving size as i like to feed small, fresh meals, and its great for a snack. Food looks good, smells good, for cat food, and my guys do eat it, just not a fav. Yummy ! Great stuff ! This is what Jax likes. As for me, I like the convenience of this. So easy! Just open by peeling back foil, serve and toss. No left overs to worry about. Plus, no more trying to find time or even remembering to stop at pet store after work to pick up pet food. Home delivery is great! My kitty says thanks Chewy! This is a flavor I had not been able to find at my local store. My cat absolutely loves it and she is very picky. So we thank you for having it available. This was a second choice flavor, and my cat is eating it, unenthusiasticly. Hoping they'll add more flavors of the "cuts" variety. This is my favorite. Once in a while I will eat tuna or salmon. It has to be cuts! I seem to have adopted an extra finicky eater for my first cat. She tires of her prescribed food quite easily, often from day to day! This combination of salmon and chicken cuts is quite different from the standard fare. My Lily has yet to refuse this variety, and it disappears from her plate in a flash! I do keep her on another brand for most of her food, but this blend of Sheba is a good treat now and again. 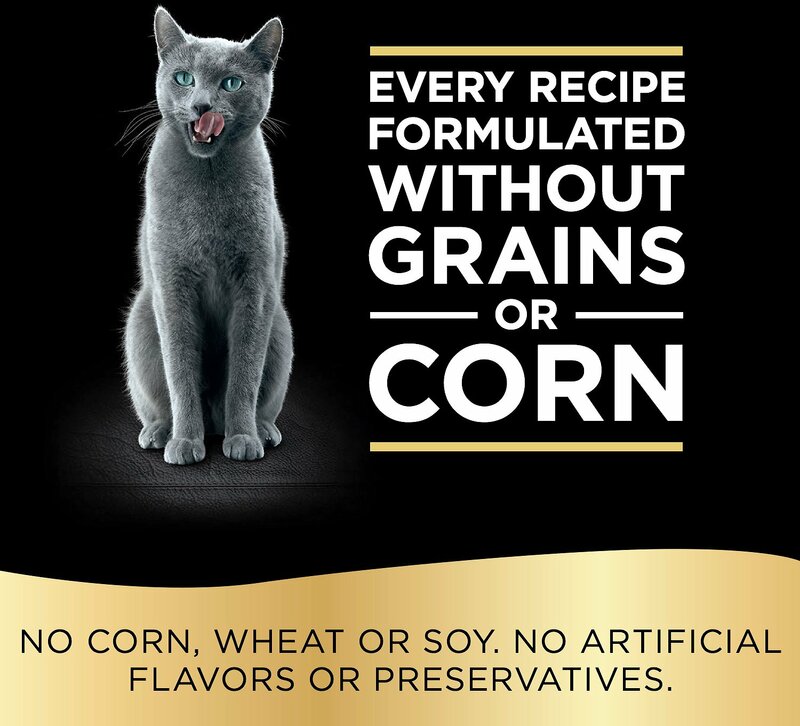 Everyone knows cats are finicky. My cat would only eat the gourmet salmon, won't touch Pate and she wouldn't eat anything other than salmon. I wanted her to have a variety and this food is now her favorite.